Rotator cuff injuries are very common and the rotator cuff is the most common cause of shoulder pain. Many rotator cuff disorders do not always involve a trauma or an injury. Some of you may have suffered a recent injury to your shoulder and some of you simply woke up with shoulder pain for no known reason. Causes of rotator cuff problems are varied and include degenerative, genetic, inflammatory or are age/activity related reasons. While many rotator cuff injuries can be caused by a recent trauma or repetitive stresses. The most common cause of rotator cuff pain is usually because of a degenerative or attritional process. The rotator cuff are a series of 4 small muscles that are located around the shoulder and deep to the deltoid, a larger and better-known muscle. These muscles coordinate the function of the shoulder by harnessing the power of the larger deltoid, pectoralis, and other muscles and turning that power into useful, well coordinated, and fluid motion. It is very easy for the larger more powerful muscles to over-power the rotator cuff and cause over-use injuries. This is a very common source of shoulder pain in overhead athletes, and weightlifters or those of you who are active in the gym. There are many different conditions which cause our rotator cuff to hurt. The majority of rotator cuff problems are due to overuse or are degenerative in nature. Some rotator cuff conditions are “acute” or the result of a recent accident or fall. Rotator cuff symptoms can vary significantly. Very severe shoulder pain might not mean you have a severe rotator cuff injury. Shoulder pain from rotator cuff tendinitis can be more severe than the pain from a tear — and shoulder pain associated with a large tear may be much less than the shoulder pain experienced by someone with a small tear. Shoulder pain in young patients (15-30) may be due to instability where the shoulder ligaments are loose and the shoulder can dislocate. Traumatic rotator cuff injuries are rare in teenagers. The pain associated with instability is because the instability causes the rotator cuff to work very hard to keep the shoulder in position. Patients over 40 who suffer from shoulder pain tend to suffer from more degenerative problems — whereas younger patients tend to suffer more overuse type injuries, typified by tendonitis and inflammation Over the age of 35-40 most shoulder pain patients will have pain due to rotator cuff tendinosis, partial rotator cuff tears, or full thickness rotator cuff tears. Symptoms from tendinosis generally come on slowly over time and reach a point where you are very uncomfortable. Some patients can identify an activity or injury which precipitated the onset of pain, but most people with rotator cuff tendinosis have no idea why their shoulder started bothering them. One of the hallmarks of rotator cuff tendinosis is terrible night pain. The pain is usually on the side, and occasionally on the front of the shoulder. Patients with tendinosis typically do not have weakness. They may have a weakness which is secondary to pain (and you simply do not want to use the arm). Snapping or popping in the shoulder may occur because the rotator cuff is no longer smooth, Patients with tendinosis may have pain when lifting their arm in certain positions, and loss of motion may occur. Pain is usually along the side of your upper arm and some people describe the pain as radiating down towards their elbow. Patients with rotator cuff tendinosis may have trouble putting on a coat, putting on a bra, trying to reach up high or reach behind their back. If your surgeon mentions that you have rotator cuff impingement, Impingement Syndrome or Rotator Cuff Syndrome — you are more than likely suffering from rotator cuff tendinosis or a partial tear or fraying of the rotator cuff. Rotator cuff impingement theorists also used to believe that a *bone spur* caused most rotator cuff problems. Most academic surgeons no longer believe that rotator cuff impingement or tears are due to bone spurs around the shoulder. If you are told you require shoulder surgery because of a bone spur… you should probably seek a second opinion. Overuse tendinitis typically occurs in patients who participate in certain sports. Pitchers, swimmers or volleyball players with shoulder pain the day after they played is a common presentation. Their pain is mild to severe. Their pain is usually along the back or side of the shoulder and responds well to rest and anti-inflammatories. Rotator cuff tendinitis in a young athlete can be severe enough that any movement of the arm is very painful. 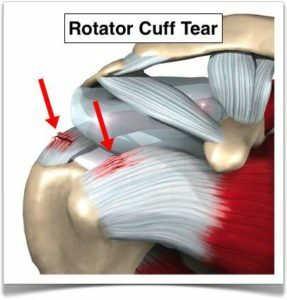 Luckily, rotator cuff tendonitis in young athletes generally responds very well to a few short weeks of rest and an exercise program with an athletic trainer or physical therapist. In general, cortisone injections should be avoided in young athletes. Rotator cuff tears are surprisingly common. Many patients have rotator cuff tears and do not even know it. Many rotator cuff tears are degenerative and are not the result of a single injury to the tendon. This means your tendon simply wore out over time. Some rotator cuff injuries or tears do occur because of trauma and are termed acute rotator cuff tears. Degenerative rotator cuff tears and acute rotator cuff tears are two different situations that require a different treatment approach in most cases. Why do some rotator cuff tears lead to pain and others do not… we don’t know!. Partial thickness rotator cuff tears…. 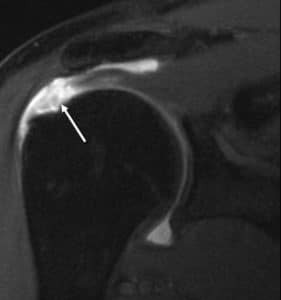 Partial thickness rotator cuff tears are very common and unless your pain has not improved with non-operative treatment, are rarely an indication for surgery. The rotator cuff is very thick and partial tears occur when a portion of the rotator cuff pulls away from its attachment to the bone. Most patients with partial thickness rotator cuff tears will present in a manner similar to patients who suffer from tendinosis—and in many situations, the treatment is very similar. Most patients with tendinosis and partial tears will improve with rest, ice, medication, physical therapy or an occasional injection. Their most common complaint is a pain with lifting the arm overhead — and they will also, typically have severe pain at night. Click here to read more on partial thickness rotator cuff tears. Recent advances have enabled us to apply a small biological patch to heal most partial thickness rotator cuff tears when your pain does not respond to non-surgical measures. Full thickness or complete tears are also common. Full-thickness rotator cuff tears need to be broken down into categories to approach them properly. Degenerative cuff tears are similar in appearance to your favorite pair of blue jeans. One day you look down and you see a hole around the knee. Did you tear them… no. The denim just wore out. Patients with different types of rotator cuff tears will present with similar symptoms or complaints. To a large degree, your symptoms from your rotator cuff tear will depend on the size of the tear, or what percent of the rotator cuff is actually torn. Most patients will have pain along the side of the shoulder, pain with reaching up, pain with turning the steering wheel in your car or pain when trying to sleep at night. The night pain, at times, can be unbearable. Patients with small rotator cuff tears may not notice any weakness… while those of you with large tears will notice weakness and difficulty lifting the arm or reaching high into a cabinet or above your head. In many instances an accurate history and physical exam can lead to an accurate diagnosis — and an MRI is not necessary. If your exam reveals severe pain and weakness, then an MRI will be helpful to see if your weakness is secondary to pain or an actual tear. Remember, based on your age, you may have had a tear BEFORE your shoulder pain began. If you have severe pain and have not improved with nonsurgical management, then an MRI can be very useful in the surgical decision-making process. Some tears of the rotator cuff may not be repairable, or have a poor prognosis (may not heal). If the torn portion has “retracted” or pulled too far away from the bone, a repair will be difficult and the re-tear or recurrence rate after surgery may be high. An MRI can tell us exactly how far the tear has retracted. Rotator cuff “atrophy and fatty infiltration”… These are very important prognostic factors when considering rotator cuff surgery. If the rotator cuff has been torn for a long time the muscle may actually turn into fat (fatty infiltration). Fat does not act like a muscle, so repairing a rotator cuff tear where the muscles have turned to fat is unlikely to improve your function. Unfortunately, even if a repair is successful, the fat will NOT turn back into muscle tissue. As with retraction, an MRI is very useful in determining the degree of atrophy or fatty infiltration. If you have a rotator cuff tear that has not responded to non-surgical measures, or a tear that is acute, an MRI can be very useful to try and determine your prognosis for recovery after rotator cuff surgery. Rotator Cuff Surgery: Is Surgery Necessary for all Rotator Cuff Tears? Many rotator cuff tears do not require surgery. Many rotator cuff tears are small and degenerative in nature. That means the rotator cuff tissue simply wore out over time. Many patients with small tears can usually be managed with physical therapy, occasional injections, and activity modification. Some tears will grow in size over time. Therefore, if non-surgical treatment is successful in alleviating your pain, you should still follow up with your surgeon to be sure the tear has not become any larger. If you try non-operative management and your pain persists— then a rotator cuff repair surgery may be indicated. Remember: Even if you are doing well —- some small tears become larger. We do not know which tears will grow and which will not, so follow-up with your surgeon is important, even if you feel fine. Traumatic rotator cuff tears are a different story altogether. If you fell, or suffered a severe injury and notice weakness, loss of motion and severe shoulder pain you should see a shoulder specialist sooner rather than later. Most active shoulder surgeons favor early rotator cuff surgery for large traumatic rotator cuff tears. This is because your tissue was most likely normal prior to trauma and therefore the results of surgery should be good with regards to improvement in strength, range of motion and elimination of pain. How is Rotator Cuff surgery performed? The surgery is performed in an operating room. Some centers will put you to sleep for the surgery, and other centers may simply put your shoulder and arm to sleep with an injection. Many shoulder surgeons are proficient at arthroscopic rotator cuff surgery. That means they can accomplish repairing rotator cuff tears arthroscopically... or through multiple small incisions. Be sure your surgeon has performed a fair number of these and is very comfortable with the technique. Many surgeons also continue to fix tears using an open incision. 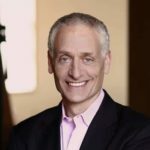 As long as the surgeon can achieve the same level of success with arthroscopic and open techniques, then the arthroscopic technique offers a number of advantages — both to you as the patient and to me as the surgeon. First, the view we obtain using an arthroscopic approach can not be equaled. I can place a small camera in places we cannot see through an open incision. My access is unlimited with an arthroscopic approach since I can move the camera around to see all the other structures in the shoulder to make sure that nothing else needs to be addressed at the same time. Second, an arthroscopic approach spares the deltoid muscle from being cut and pulled open, which can lead to significant pain and stiffness. Bottom line … both open and arthroscopic methods of rotator cuff surgery are proven to have similar track records for small rotator cuff tears and medium rotator cuff tears. 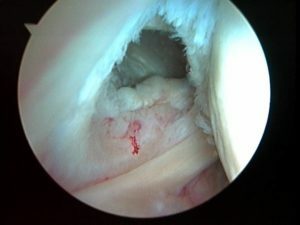 The main difference is the smaller incision, less trauma, and perhaps a shorter duration on pain medications with arthroscopic rotator cuff surgery techniques. An arthroscopic approach does NOT change the amount of time in a sling after surgery, nor does it change the fact that you will require an extensive amount of physical therapy after your sling comes off to restore motion, strength, and function. If you live in Dutchess, or Westchester County, NY, call 914-789-2735 to schedule an appointment.